In Emanations, Susan Butler, Lindy Lee, and Arthur Renwick evoke the auras of their familial, cultural, and technological origins. In Delegates: Chiefs of the Earth and Sky (2004), Arthur Renwick criticizes the injustices suffered by First Nations chiefs and warriors, who, in 1868, were delegated to sign the Fort Laramie Treaty, written in a language they did not understand. When the delegates were assembled, the treaty was read aloud. 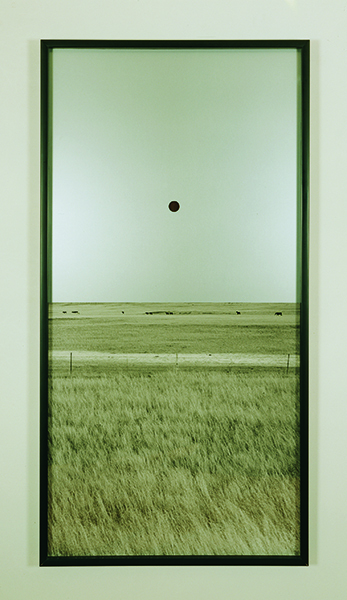 Renwick combines South Dakota landscapes that he names for the leaders with floating punctuation marks that symbolize both the written language of the oppressor and the silences that punctuated the incomprehensible flow. These glowing photographic monuments capture the projective function of the beholder’s imagination. Arthur Renwick, born 1965 in Kitamaat, BC, is a member of the Haisla First Nation. His work combines photography with a variety of materials to explore relationships between cultural identity and colonial development and to address the impact of industry on landscape and culture. He received a BFA from Emily Carr College of Art and Design in Vancouver and an MFA from Concordia University in Montreal. Renwick has exhibited his work nationally and internationally. It has been acquired by both private collectors and institutions, including the Winnipeg Art Gallery and the National Gallery of Canada. Renwick lives in Toronto and teaches at the University of Guelph, Ontario. His work is represented by Leo Kamen Gallery in Toronto.